A Tour of Myanmar with Louis! Hey Tony and Chelsea! I would like to invite you to tour a small corner of my world. The people, culture, landscape, architecture, pagodas, temples, history, and FOOD is nothing short of absolute wonder. The country is beginning to modernize with the healthy mixture of traditional and modern comforts. It is an absolutely a great time to visit. We will visit a total of 6 diverse cities and numerous photogenic locations. Read on for a detailed plan! (Kyle Wolfe corrected my terrible grammar and sentence structure). Land in Yangon (RGN) International Airport. Transfer to hotel, unpack, and explore the local downtown area. Visit the major landmarks and locations in Yangon. Shwedagon Pagoda, Kandawagyi, Karawait, Chinatown, Sule Pagoda, Botataung Pagoda, Strand night market, People's Square, Independence Monument, and more! Walk around town and explore the local culture. EAT! Burmese food is fragrant, flavorful, and quite unique. Visit all the local landmarks and set up cameras for golden hour shoots! Bike tour to Dala or around town with Uncharted Horizons. An iconic 325ft golden Pagoda believed to be the most sacred in Myanmar. The lake houses a photogenic wooden bridge that locals frequent. Browse around downtown and capture the sprawling city life. Any nooks and crannies of Yangon is filled with small shops. A short brisk walk will net you a peek into their lives. If we should be so lucky to visit Myanmar between April 13-16, we will witness and participate in the Myanmar New Year Water Festival. It is celebrated for four days in mid-April with people dousing water amongst one another. The country and its people gears up to celebrate this event weeks in advance. It is the hottest time of the year to visit Myanmar, but this is a unique event in the world. Camera gear will get wet so some advance planning is required. Locals celebrating the new year in the water festival. People lining up at local stages to participate in the event. An amazingly photogenic ancient city with temples as far as the eyes can see; there are thousands of temples and stupas. We will arrive either very early morning by bus or mid-day by flight. We will spend the next 3 days exploring the culture, temples, architecture, and the people of Bagan. Temples on the list: Ananda Temple, That Bin Nyu, Gawdaw Palin, Shwe San Daw, Maha Bodhi, Shwegu Gyi, Dammanyan Gyi, Sulammani, A Lo Daw Pyai pagoda. Early Morning Hot Air Balloon. (Season for the balloons varies). Explore the local temples by car/electric scooter/on foot! We will also visit the local villages around the city and get a peek of the local rural life. Take an oxcart taxi?, Most of the roads in Bagan is dirt road (it is relatively smooth), giving it a rural feel. A beautiful ancient city with temples as far as the eyes can see. Some natural framing with the locals right in the middle of my shot! A Lo Daw Pyai Pagoda during fullmoon rise. A Slice of Life in Bagan! Visit the local temples in the hopes of catching a slice of the local life. A local vendor preparing red onions for sale. Monks accepting alms in the morning. A villager coming home on an oxcart. Villagers coming back from a harvest. Kids at Shwe Zi Gong pagoda that can recite the history of the pagoda in 5 different languages. Villagers on the way home from a harvest. After exploring the ancient city of Bagan, we will take a bus/car ride to Mandalay. It is the last royal capital of Myanmar with a grand palace in the center of town. The world's longest wooden bridge built in 1850, U Bein Bridge. Walk around the palace moat. Hike the Mandalay Hill for the temple and view on top (driving up is ok too). Day trip to Sagaing to explore the local culture. Walk or bike along the photogenic U Bein (world's longest wooden bridge). Mandalay palace is surrounded by a moat and creates an awesome reflection during sunset or sunrise. The world's longest wooden bridge built in 1850, U Bein Bridge. Walkable, and Bikeable. Worth spending an evening for sunset. Young monk heading back to temple. Sights like these are common in the most areas of Myanmar. It is a tradition to send young boys to become monks for some period of time at a local temple. Inle lake is probably one of the most photogenic and iconic places Myanmar has to offer. It is a very shallow lake with an average depth of 7 feet in the dry seasons and the only mode of transportation available is boat! Boat rides around the lake visiting local villages and floating markets. If time permits, and if you are feeling adventurous, we can join a Kalaw-Inle trekking tour (one, two, or three day trek). Visit interesting local people. 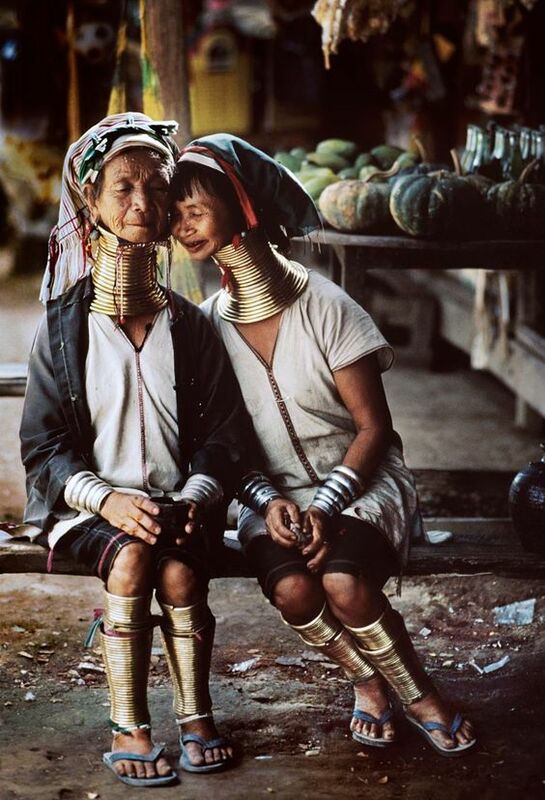 There is a interesting group of Kayan people known as the Padaung, they are known for wearing long brass rings around their neck as a sign of beauty. The hotels are build on top of the water and whole villages are constructed on water. 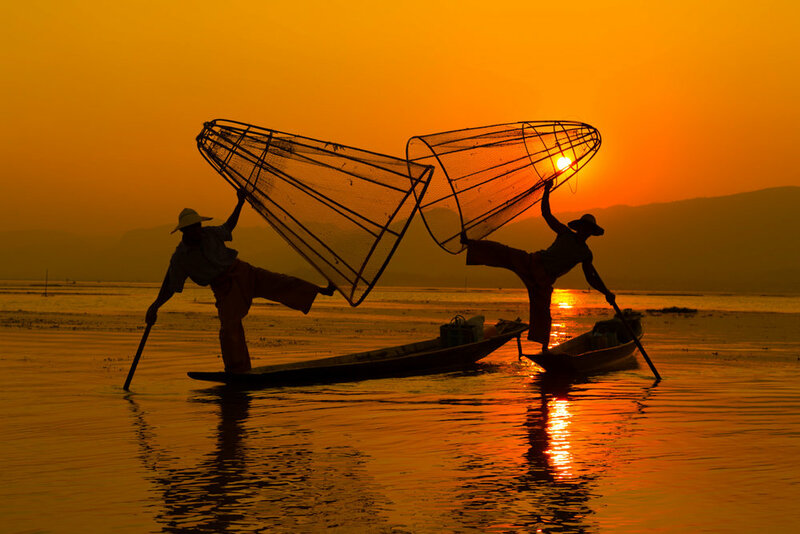 Inle is most commonly known for fishermen using their legs to maneuver their fishing nets. In the months of October, there is a ceremonial Festival known as Hpuang Daw U, a traditional boat racing event. Dozens of leg-rowers compete in this race. Each boat plowing through water manned by fishermen in incredibly photogenic Shan clothing. Fishermen use their legs to maneuver the fishing nets. A 4 star hotel! Whole villages are constructed over water. A Sunset view from the hotel. A twilight long exposure after sunset. The Padaung people mainly live in Kayah and Shan state, but few have travelled to Inle to start new lives. They are known for wearing long brass rings around their necks as a sign of beauty. These rings are a single piece of brass woven and coiled around their neck. Young girls early as the age of 5 wear these rings around their necks. The primary mode of transportation in the lake. A Pagoda right in the middle of the lake. Hundreds of pagoda near Inle Lake. This unique pagoda contains hundreds of small structures lined up uniformly. Stairs leading to a cave with over 8000 images of buddha. After exploring Inle Lake and Taunggyi, we will head back to Yangon via bus or car. We will spend the night and the next day relaxing in Yangon exploring more of the local people and the night markets. We will be packing and preparing for Kyaik Htee Yoe Pagoda in the Mon State. Local monks touring the Kandawgyi lake. This Pagoda is famous and iconic amongst all the people of Myanmar. It is known for its golden boulder and pagoda balancing precariously over a cliff. This Pagoda is now accessible via car all the way to the top of the mountain. Though a short (2 hour) hike is popular with the locals. Kyaik Htee Yoe Pagoda overlooking a cliff. The fame of this golden rock comes from it's seemingly magical ability to balance itself over a cliff. Pilgrims and devotees pasting pure gold leaves on the side of the golden rock. The rock's stunning area of contact with the cliff. When you overpack for a hiking trip and need help carrying your bags, these guys will save your day and back. Pilgrims lighting candles to begin their prayers. Local Monks accepting morning alms in Kyaik Htee Yo. After exploring Kyaik Htee Yoe Pagoda. We will head back to Yangon, rest for a day and fly back home! The food is Myanmar is sooooo good that it needs its own section. The cuisine includes an incredibly diverse variety due to contributions by a large number of ethnic groups. 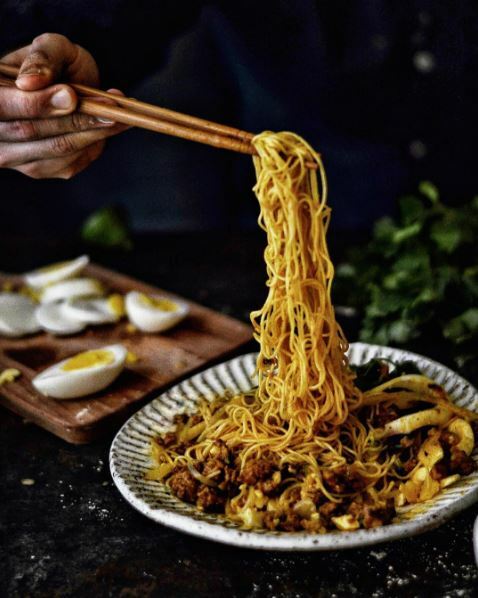 Although, burmese cuisine is influenced by Indian, Chinese, and Thai, it evolved to be so unique that the flavors stands out amongst the traditional asian taste. A typical lunch in Yangon, a good portion of rice and meat paired with creamy tea and tea leaf salad. Rice noodle and fish soup. This is served as breakfast. One of my personal favorites! Another personal favorite! 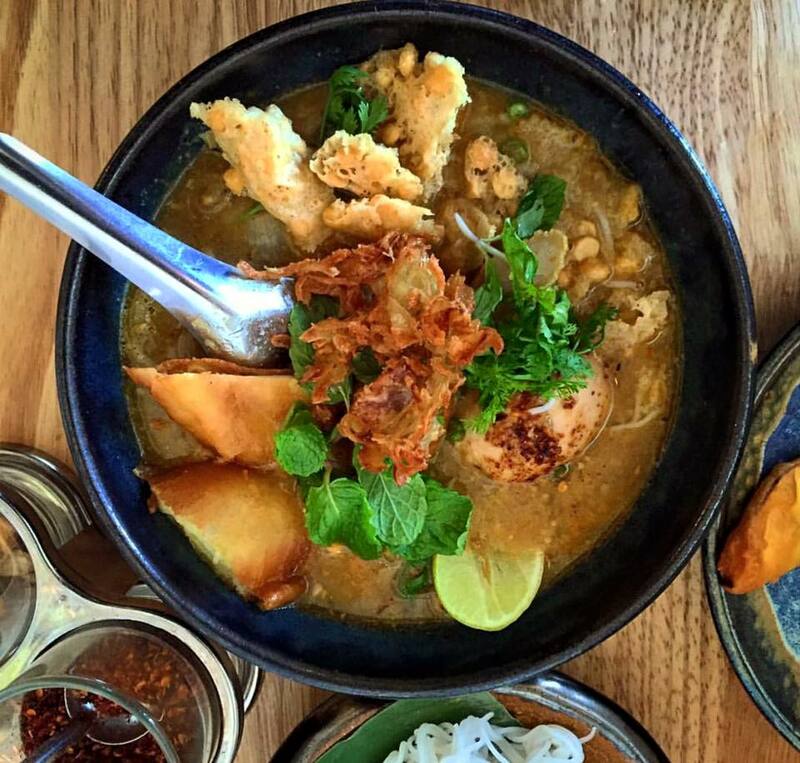 A breakfast noodle soup serviced in creamy-coconut-curry broth. Usually served with curry chicken. A hearty salad filled with flavors and textures. Typically served with hard boiled egg, a choice of chicken or pork. There are so many different kinds of noodles you can order for this dish; flat, round, curried, tamarind, rice-based, bean-based. Burmese egg curry dish cooked in tamarind sauce. A longstanding traditional appetizer dish served with fermented or pickled tea leaf. 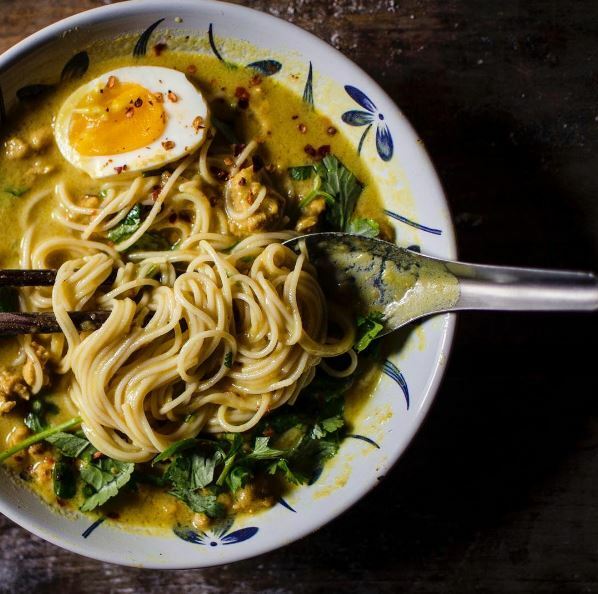 The dry noodle version of the Coconut Curry Noodle Soup. A standard morning tea. With rich flavors and textures the tea is usually loaded with condensed milk. 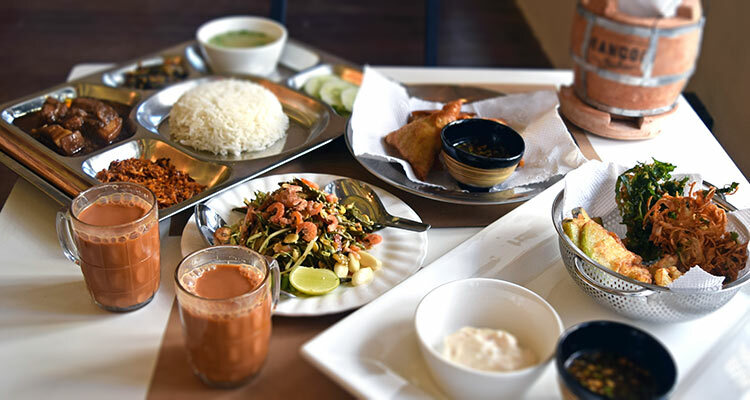 Tea is usually served with a variety of bread and naan for breakfast. A traditional snack that is popular on the street made of rice flour, boiled egg, and assorted vegetables.